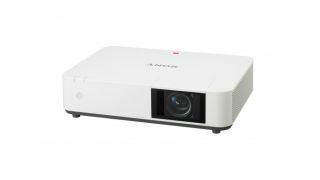 At ISE, Sony expanded its range of laser light source (Z-Phosphor) projectors by introducing two new LaserLite models, and launched Vision Exchange, an all-new collaboration solution for education and corporate users. The new projector models are aimed at making laser technology more cost-effective for the installation market. Designed for commercial applications, including classrooms and meeting rooms, the new VPL-PHZ10 (WUXGA) and VPL-PWZ10 (WXGA) projectors bring the benefits of laser technology—image quality, color reproduction, and virtually zero-maintenance operation—to customers who previously may have only been able to experience lamp-based projection. The new fixed wide zoom lens models provide users with a lower-cost, high-quality option for installing laser projections in rooms traditionally geared toward lamp-based technology. The new projectors’ light source have a total constant brightness of 4,500 lumens for up to 12,000 hours depending on usage environment, enabling users to experience the projectors’ original level of image quality more than five years in standard use, while achieving a maximum 5,000lm brightness when the constant brightness mode is off. Vision ExchangeAlso launched at the show, Vision Exchange is designed to bring together students, lecturers, and presenters in a workgroup-based environment that encourages creative discussion and knowledge exchange. Engineered for higher education and corporate conference rooms, Vision Exchange provides a flexible solution to suit a range of teaching spaces and meeting areas. Teams can brainstorm and work collaboratively, wirelessly sharing content from everyone’s laptop or tablet. Via a simple license option, a remote communication option lets workgroups connect with other sites using standards-based videoconference systems. Participants can share content from their own devices (laptops, tablets, and smartphones), and annotations overlaid on images or whiteboard descriptions in real-time.